The round belt keeps surface contact with the part at a minimum, and this make the conveyors they are used for ideal for drying, or reducing the contamination of products. Round belts are usually made of polymer materials which offer impressive chemical and abrasion resistance and do not need to be tensioned or have adjustments tracked. Also because the belt has no fibers, it is suitable for clean room applications. These belts do not require tracking or permit operation in both directions without lateral position. Round belts are solid or hollow lengths of cylindrical material and they maintain contact with belt pulleys using friction and must be stretched in order to operate. These round belts are typically used for power transmission applications like packaging machinery, printers and photocopiers, conveying and imaging equipment. Round bels can also provide power transmission to conveyors in different configurations than a straight conveyor. There are different types of round belts with varying strengths, elasticities, and transmissions. The first is the nitrile rubber which is resistant to petroleum hydrocarbons and is ideal for processes involving oils, and alcohols. The second is neoprene which is resistant under a vast range of temperature conditions and is very durable as it can withstand twisting and breakage. The third is polyurethane, and this covers the variety or urethane round belts that there are. These are generally abrasion-resistant. The fourth and final type is rubber which allows for unique elastic properties. There are several key features of round belts. They come in different textures, they are economical, tough and durable, non-marking, wont fray, easily cleaned available with UV resistance, come in different colors and they fit different pulleys. There are other things to consider however when picking out a round belt. These include reinforcement, size, and tensile strength. Before purchasing, the kinds of materials needed to reinforce the belt should be considered. Also the size specifications of the outside diameter and outside circumference should be considered. Before purchase, it is important to be sure of the tensile strength of the belt which refers to the maximum recommended tension during normal operation. 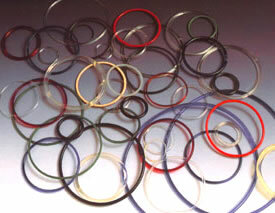 Round Belts Round Belts are also commonly called O-ring belts, endless round belts or endless drive belts. They are mainly used for power transmission applications and line shaft or live roller conveyors, and powered roller conveyors. These belts are designed to stretch, so they do not need a belt tensioner.